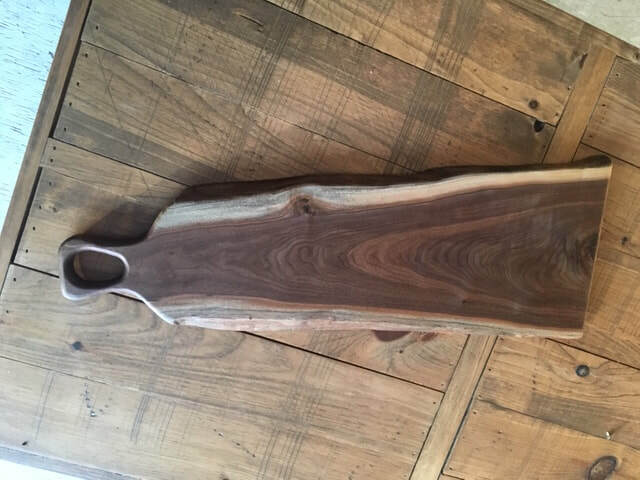 Paul Riley, owner of Dorfred Woodworks, creates live edge and regular Charcuterie/cheese boards, wooden baby rattles, coasters, and wine caddies in Norwood, Ontario. "My Dad used to do some woodworking when we were growing up, and when he retired from dairy farming, he built his workshop in their basement. After he passed away, Mom gave me his tools to add to my workshop. So, when I started doing craft shows I used our family farm name Dorfred as my business name to thank him." When asked which item he has the most fun creating, Paul says, "Mostly the charcuterie boards. 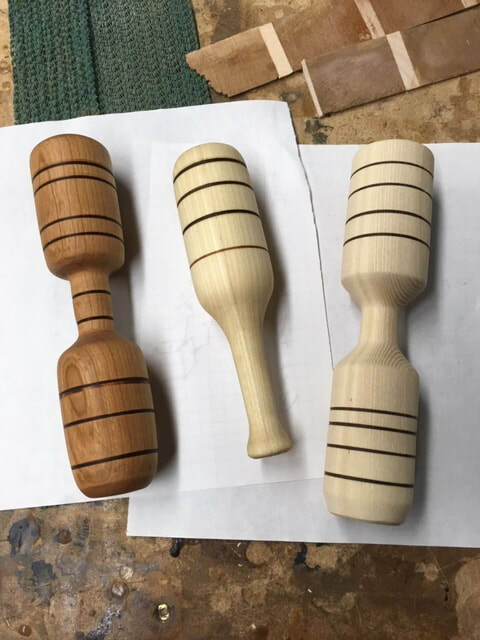 I spend time looking at a piece of wood, figuring out how to showcase the grain.And I do enjoy turning the baby rattles, taking a rectangular piece of wood and making to into something for a child to enjoy." "My workshop is in my basement, which required installing a dust collection system and air cleaner to cut down on the time spent dusting upstairs." While creating, Paul usually has the radio on. "Most days it's classic hard rock." 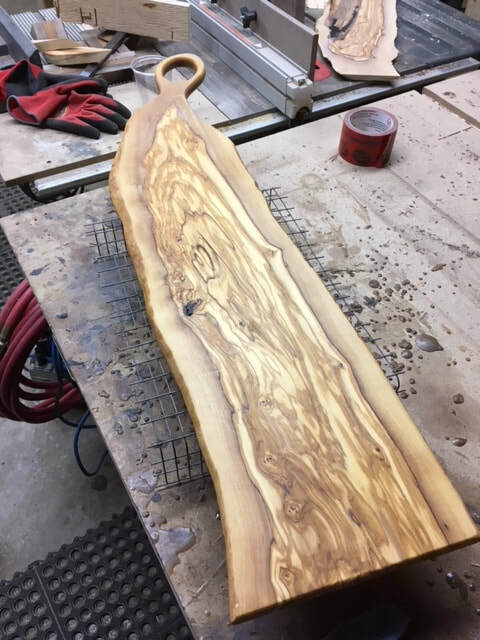 "I really enjoy looking at a piece of wood and trying to picture the best way to showcase the natural grain, and create something useful. The hardest part is waiting for the glue to dry." 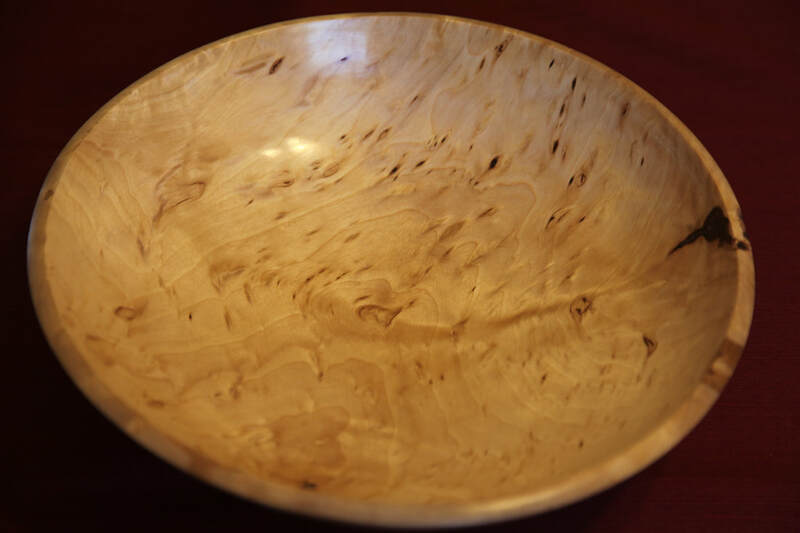 "My favourite piece is a live-edge charcuterie board I made out of a piece of a olive wood. The grain on it is awesome." 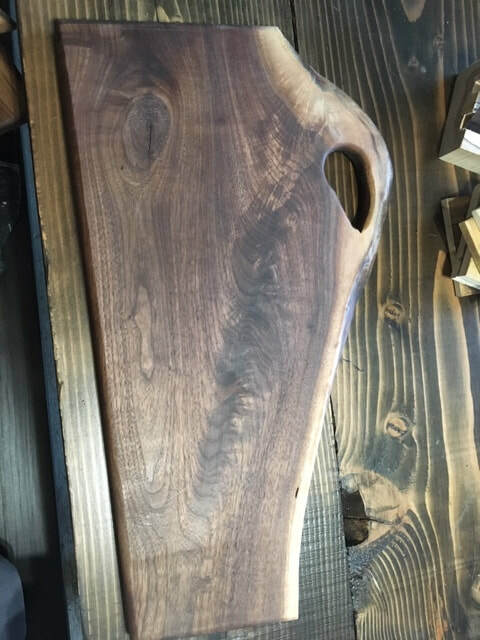 When asked for a memorable response to his work, Paul says, "One of my best friends gave me some boards from their family farm and asked me to make a cutting board for his Dad. My friend called me after, and said his Dad was a little overwhelmed when he found out where the wood had come from." "Unfortunately, doing woodworking as a hobby doesn't pay the bills, so I do have a day job and I am involved with my church. I'm a firm believer in buying local. All the wood I use comes from one of two local lumberyards/ sawmills,one in Peterborough, and the other less than an hour away. Each one has different species of wood, so what I'm working on making determines where I go.I can't expect my neighbours to buy from me when I don't buy from them.And all my cutting boards and baby rattles are made with food safe glue and finishes. 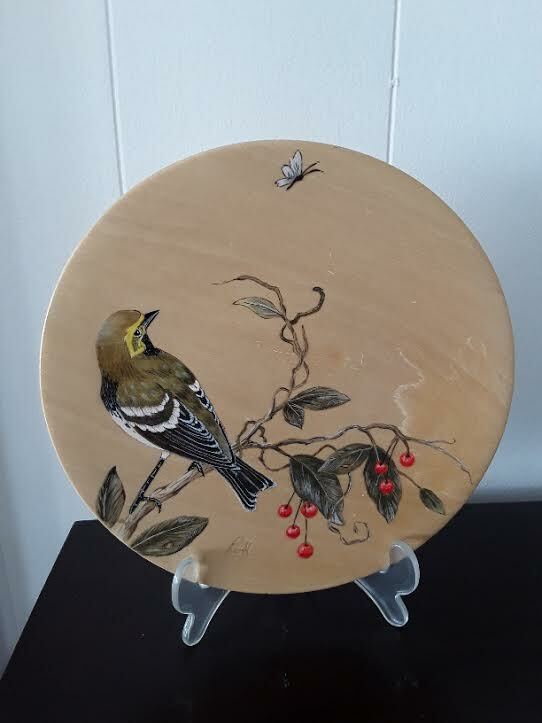 You can meet Paul and buy his gorgeous creations at The Artisan Fair on Dec 9, 2018 in the Evinrude Centre (Peterborough, ON), 10am-2pm! 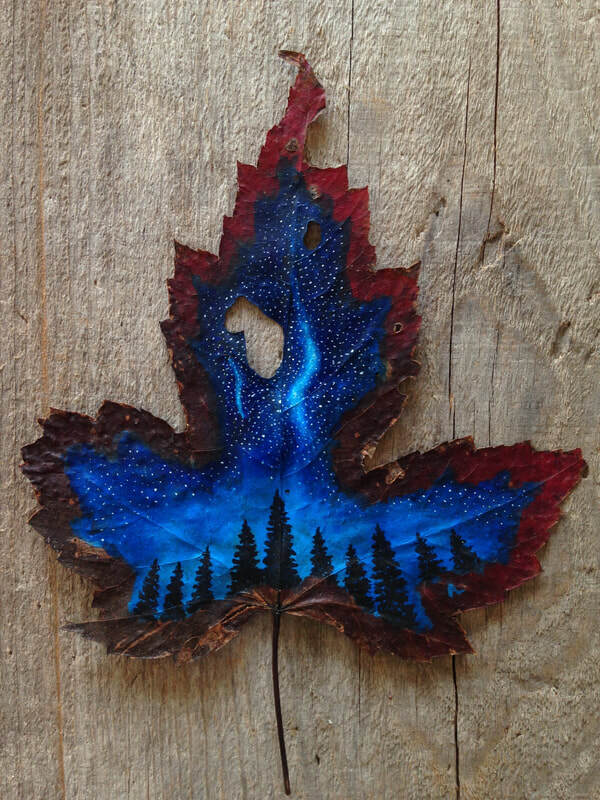 I create original pieces of artwork by collecting and hand painting leaves that have been collected in Northern Ontario. Each piece is carefully framed for purchase. I began painting on leaves when I was working for a packaging company and I saw such excessive waste that I didn't have any power to change. It was very frustrating contributing to such a wasteful industry and I wanted to do SOMETHING positive to counter act that. 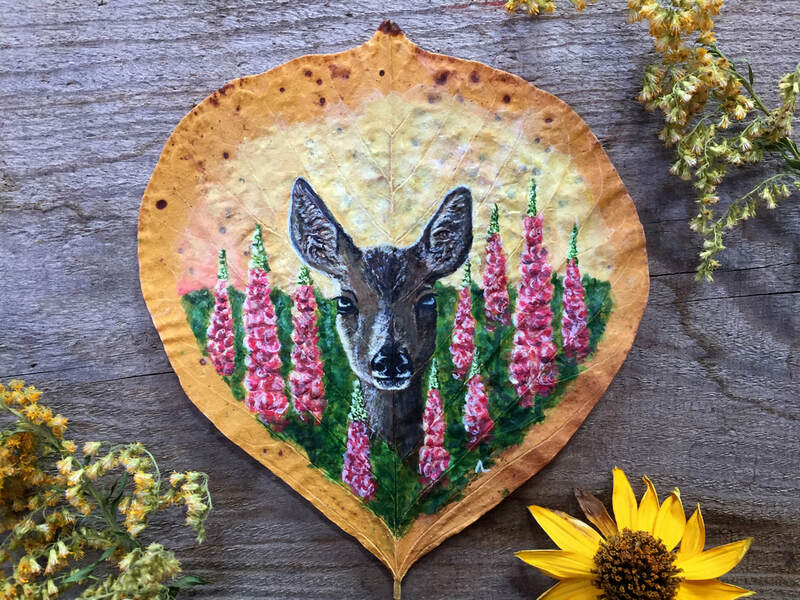 I began reading up on species at risk and changes in the environment and painted them onto leaves as an intriguing and different learning visual. As my painting progressed, people actually started to show interest in purchasing my pieces. With encouragement from my family and friends I did actually take the leap and put my work out for sale at a local coffee shop in my home town and the response has continued to grow from there. ​Every piece is fun to create because there is usually thoug ht and research incorporated into each one. 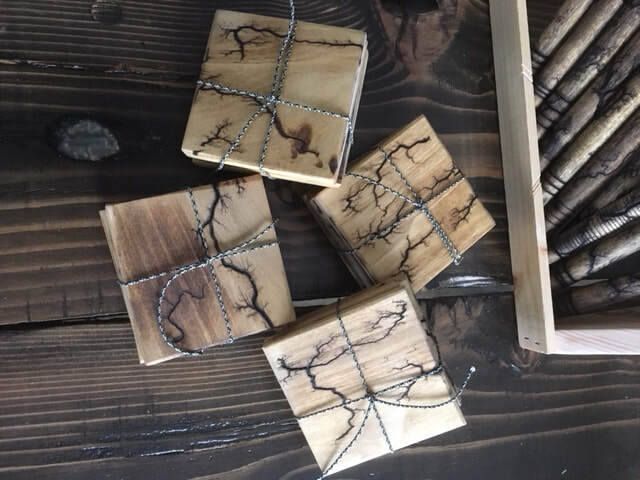 Every piece has a story or reasoning behind it and how it connects to people, wildlife and the environment. 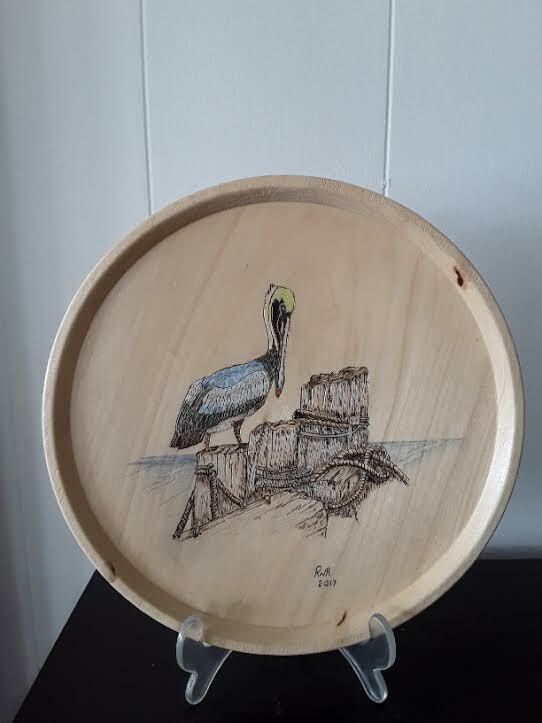 Raising awareness about conservation and human impact is something I am extremely passionate about so being able to connect this with painting makes it a fun experience. Each leaf is also so unique! It is fun learning how each texture will react with each painted subject. I most often pursue themes of wildlife and nature. I also like to highlight community, such as landmarks with sunsets or night skies. I believe being involved in a community is an important factor when it comes to creating change and building awareness for the needs of that community and its health. I often enjoy listening to music while painting. I don't work well with distractions of conversation. ​Ideas pop up throughout every day life. Whether it be while on a walk or doing a mundane task like the dishes. My mind will often wander to something I have read or a fact I have learned about that I think should be highlighted in a painting. If ever I am stuck for inspiration I will often scroll through the Ontario species at risk act to see who I would like to share information on. My passion for positive impacts on nature and wildlife really direct my inspiration. With this type of artwork there are quite a few difficult tasks. 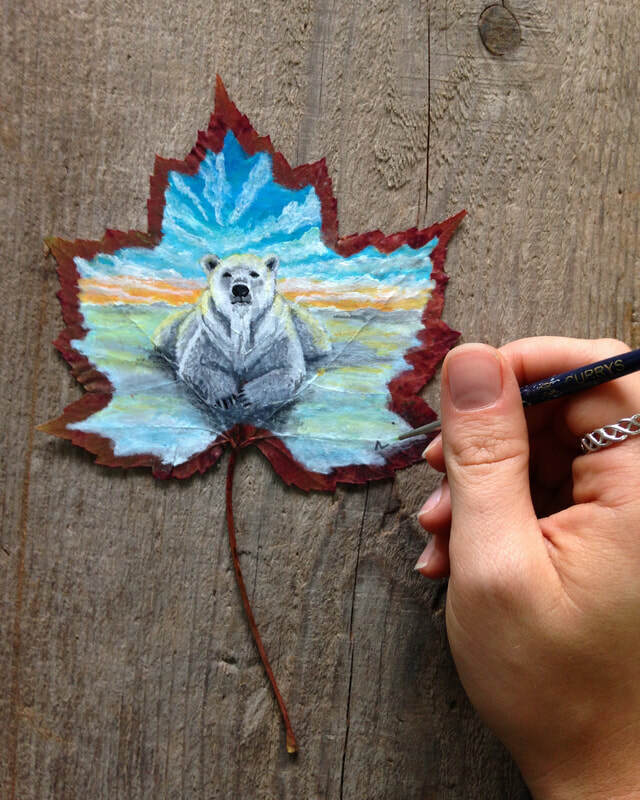 Painting on the leaf itself can be quite tedious depending on the leaf and how thin or uneven it may be. Each texture and shape varies so much that each one is a new medium. Another hurdle is often the framing. The cleaning of the glass and positioning of the leaf can be quite a process as well. There are also many different task involved from start to finish. 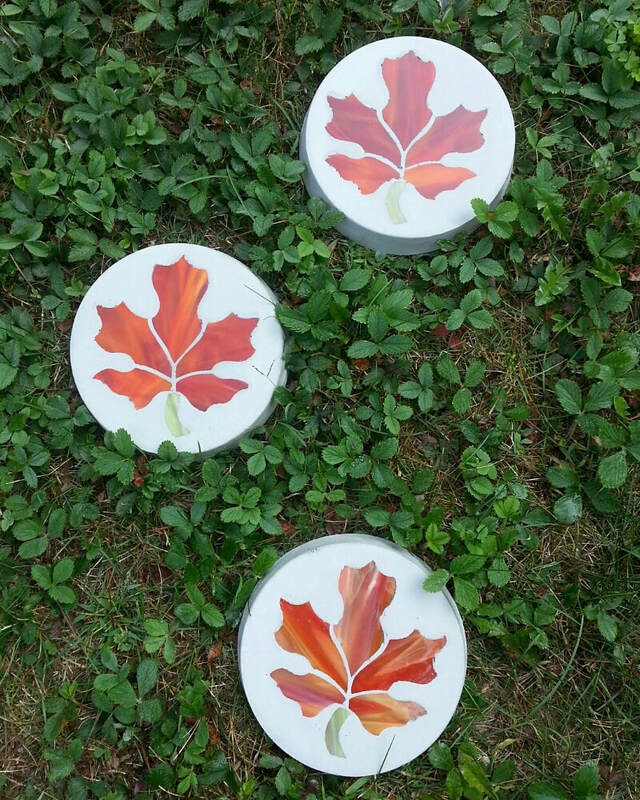 From collecting the leaves in the fall, pressing and drying them, transferring them into a safe storage area, picking a subject to bring to life, researching, the painting, framing and then to prepping the piece for display. I certainly have a few favourite pieces. Many of the wildlife pieces and night skies come to mind. My overall favourite may very well be my first polar bear piece called "Polar Fever". I remember I began to paint this piece because I felt so frustrated that we cannot directly do more to help animals that are suffering from the effects of climate change. There is no quick fix or even direct task that can be done to immediately aid them so I wanted to illustrate that with his expression and position. I then had written words that went into more detail of my thoughts on the subject. I was very happy with how this piece had turned out and I feel like it is perfect example of what the mission of my artwork is. I can also now proudly say that this piece sold with proceeds going to the care of the Polar Bears in Cochrane, Ont. that live in a conservatory called The Polar Bear Habitat which educates visitors on Polar Bears and climate change. So overall this piece had the impact I hope all of my pieces may one day have. Seeing the connection that people can make when looking at a completed piece is definitely memorable. When they ask questions about myself and my process, I know they are engaged with what they are viewing and that it is creating a positive impact. For me that is important to know and remember as well, as I continue to create impressionable pieces that mean a lot more than mass produced artwork. The purpose of this artwork is that it reduces waste. Although it is not completely waste free, I always strive to choose materials that have the smallest impact possible. My paints are not special or eco friendly but I make sure to choose paints that come in packaging that can be reused or easily recycled (no foil tubes). I use recycled kraft papers and boxes for shipping and packaging as this has the smallest impact and can be either recycled or composted. All of my printed materials (postcards, business cards, info cards and promotional material) are printed in recycled post-consumer paper whenever possible. 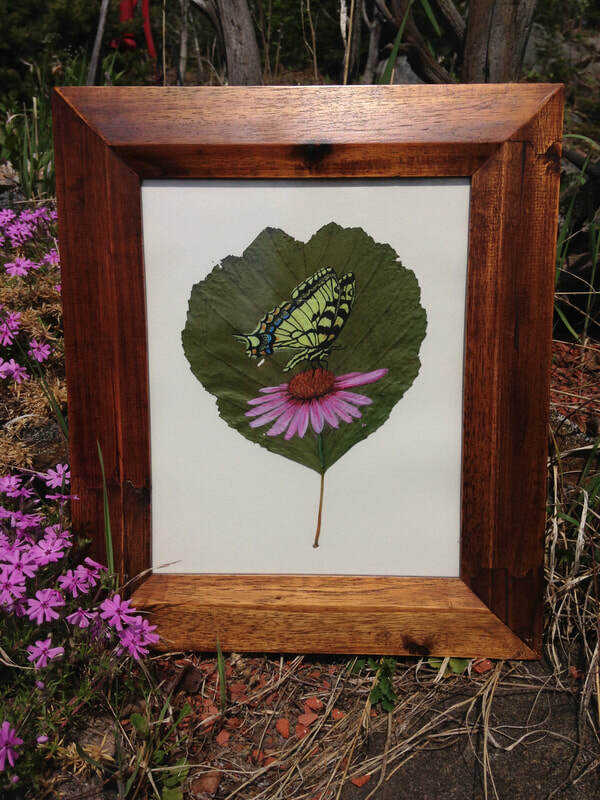 I am also in the works of creating frames from recycled wood instead of using processed frames! Each detail is taken into account to illustrate the value and importance of waste reduction and I hope that anyone looking at my artwork can know that I will always be transparent about my process and my personal lifestyle. I believe it is important for consumers to know what their dollars are supporting, especially as it relates to the effects on the environment. Currently I am in school for Forestry at Fleming College! I want to pursue a career that may allow me to make a positive impact on the environment and hopefully to create more of an impact than just my artwork would. I also enjoy fitness and cooking as well as spending time with my family, friends and pets. I garden a lot in the summer and try to spend time outdoors as much as possible, in any season. I have pieces on display for purchase at Boiling Over's Coffee Vault in Lindsay (140 Kent St W, Lindsay, ON K9V 2Y4) as well as Kuppajo Espresso Bar in Sudbury (109 Larch St, Sudbury, ON P3E 1B8). I do also have an Etsy shop that has a variety of pieces available for purchase. 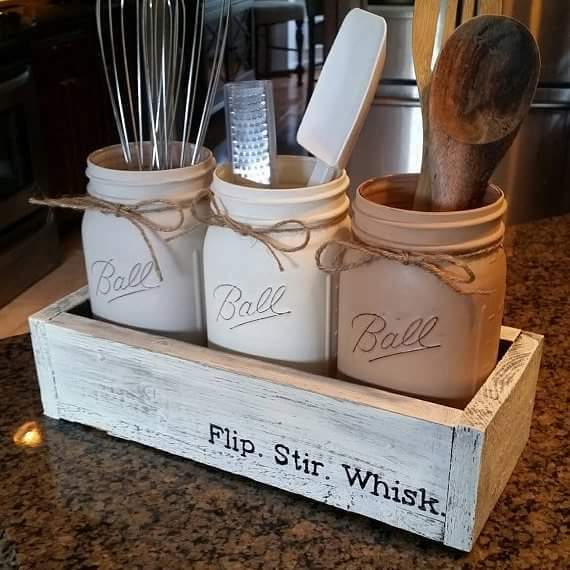 (https://www.etsy.com/shop/alcreativesshop) ​." 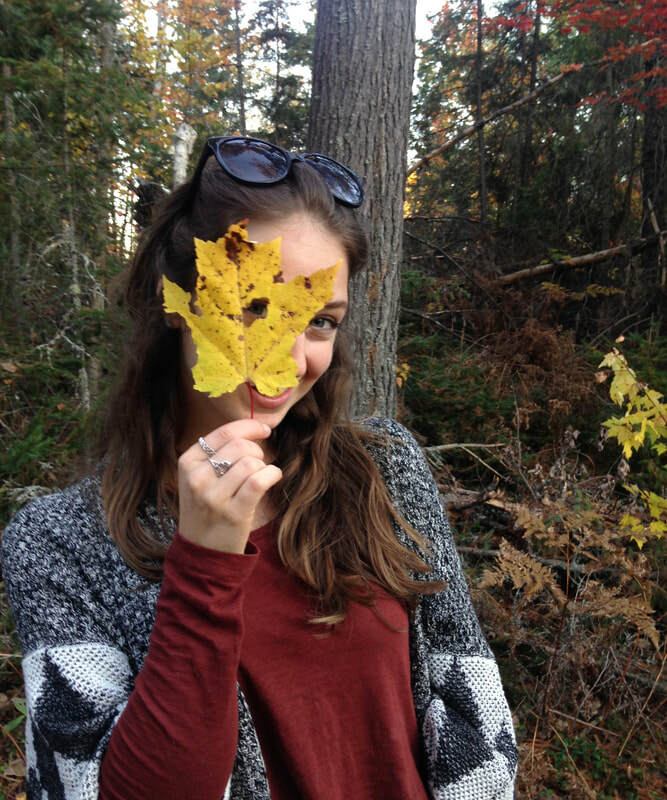 You can meet Alexandra and buy her creations at The Artisan Fair in the Evinrude Centre on Dec 9, 2018 between 10 am and 2 pm! 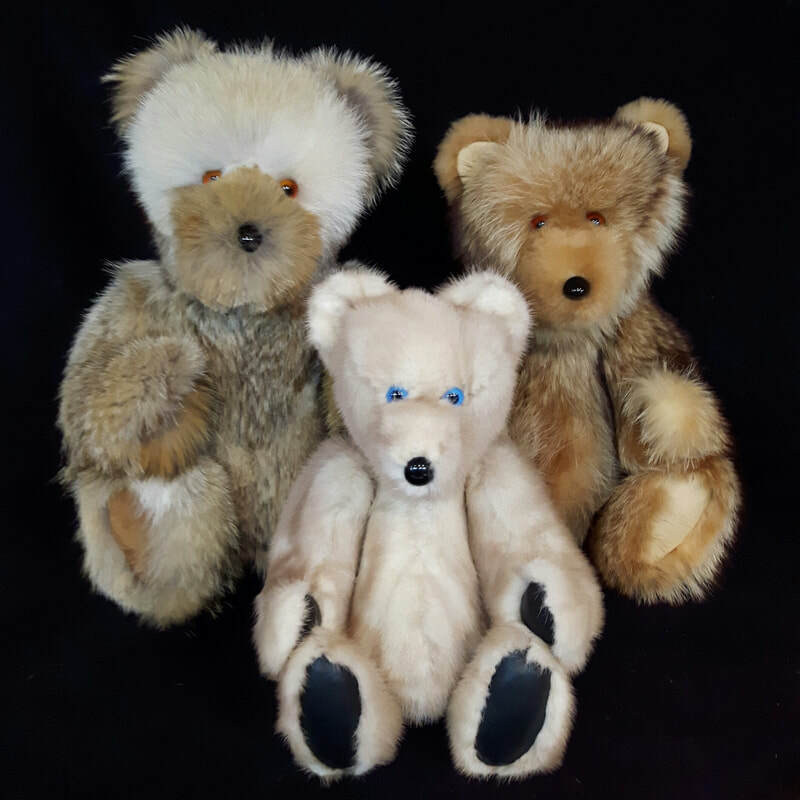 Cindy creates keepsake teddybears from fur coats, nature inspired stained glass, and herbal products from herbs she grows. "Always had to urge to create. I initially wanted to be a potter and made figurines from clay I dug out of the creek bed behind my parents house when I was a child." I like the designing aspect of any project but I enjoy seeing the personality of the teddybears emerge once they get their glass eyes installed. 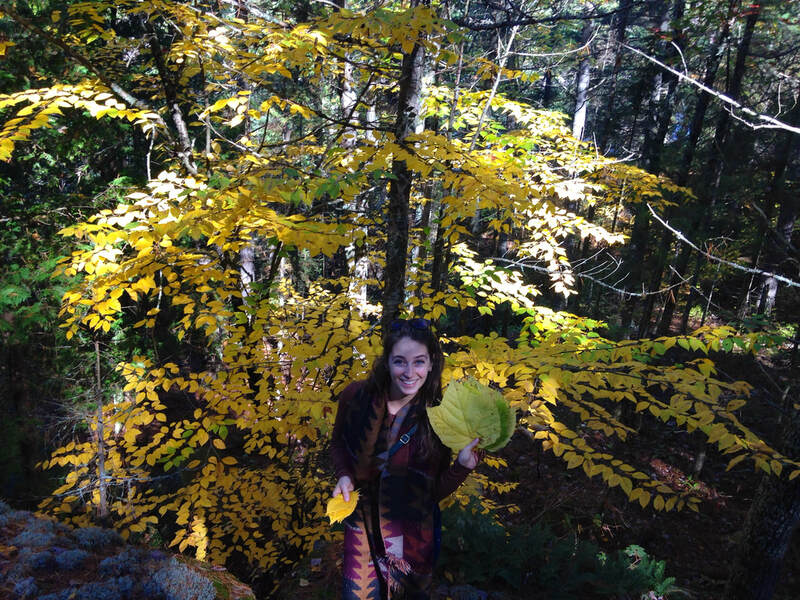 I am mostly influenced by nature and use a lot of raw materials found in my backyard. Cindy has a separate workshop from her house in her backyard. While working on projects there, sometimes she listens to the radio, but she says "mostly I talk/ mutter/sing to myself." When asked what memorable responses she's had to her work, Cindy says, "I've had people cry when they see a bear made from their grandma's fur coat. It's a tangible reminder of their relationship." 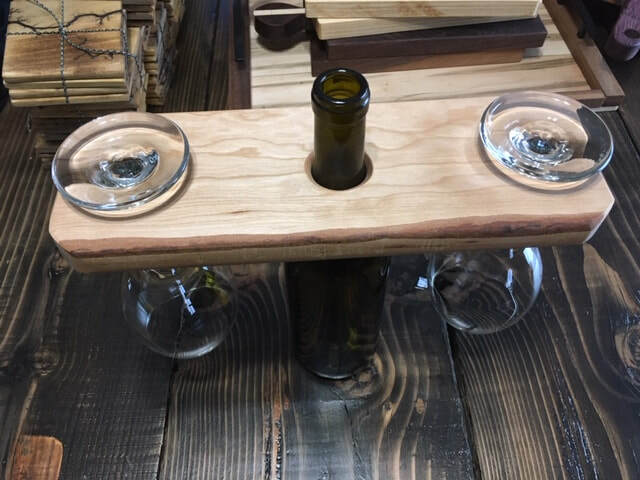 Hayward turns wood into Christmas ornaments, wine stoppers, bowls, lidded boxes, vases, spin tops, and platters. 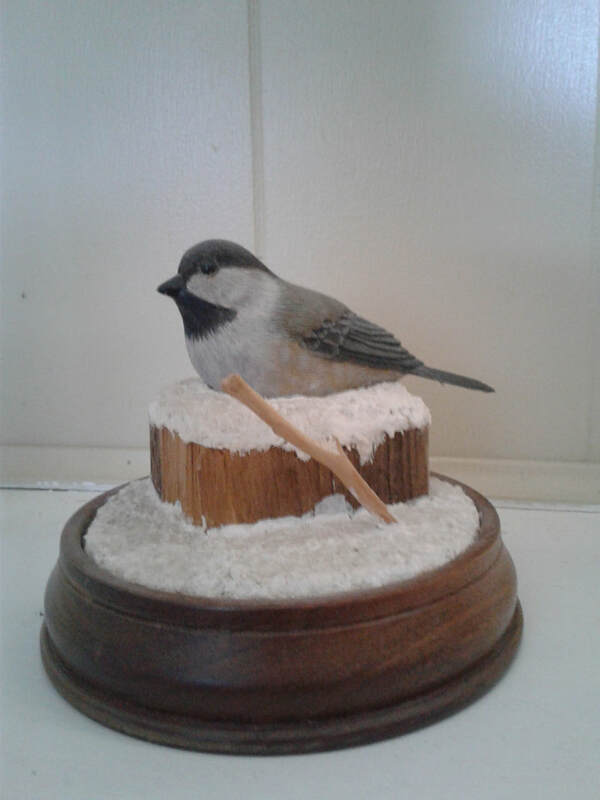 He says, "I enjoyed wood turning in school (a few years ago) and when I retired I joined the Kawartha Woodturners Guild. Seeing the beauty of the many creations that other turners had done, I decided to try my hand at it. I was hooked and the rest is history." 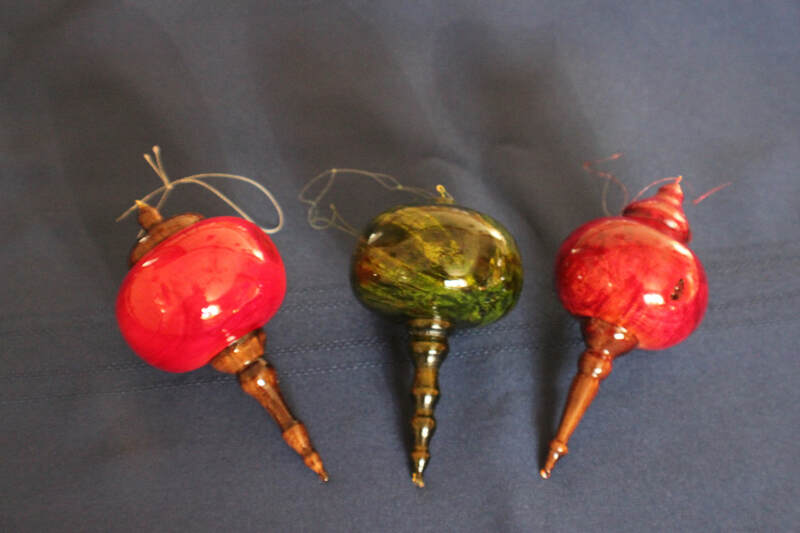 Hayward has the most fun creating Christmas tree ornaments made from discarded Christmas trees. 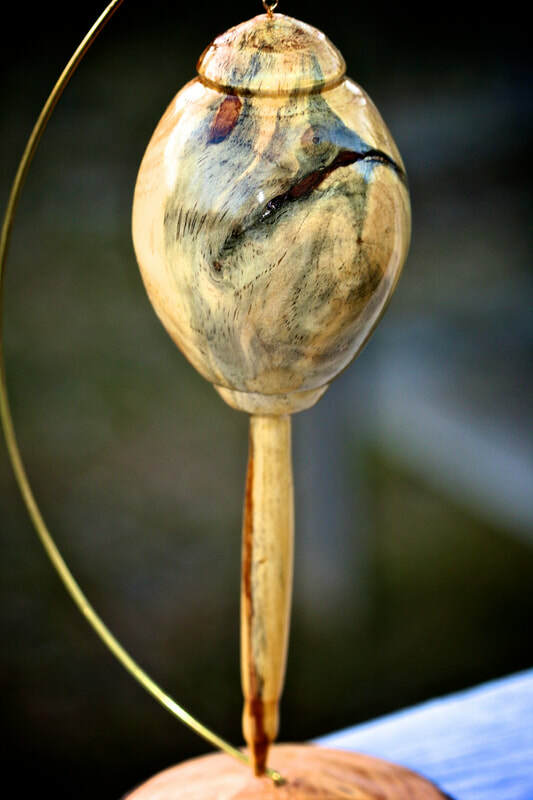 When asked what themes he pursues in his creations, he says, "Whatever the piece of wood gives me." Working in his workshop, Hayward says he doesn't listen to music or do anything else. "My mind is on the piece that I am creating. It requires full concentration." Hayward gets his inspiration from the wood. The most memorable response Hayward has had to his work has been "Two ladies purchasing ornaments to be displayed on a government tree in Ottawa." When not creating, Hayward does household chores, walks the dog and collects wood. More of his exquisite work can be seen on Facebook at M & H Designs. Come meet Hayward on December 9th at the Evinrude Centre (911 Monaghan Rd in Peterborough) between 10 am and 2 pm! 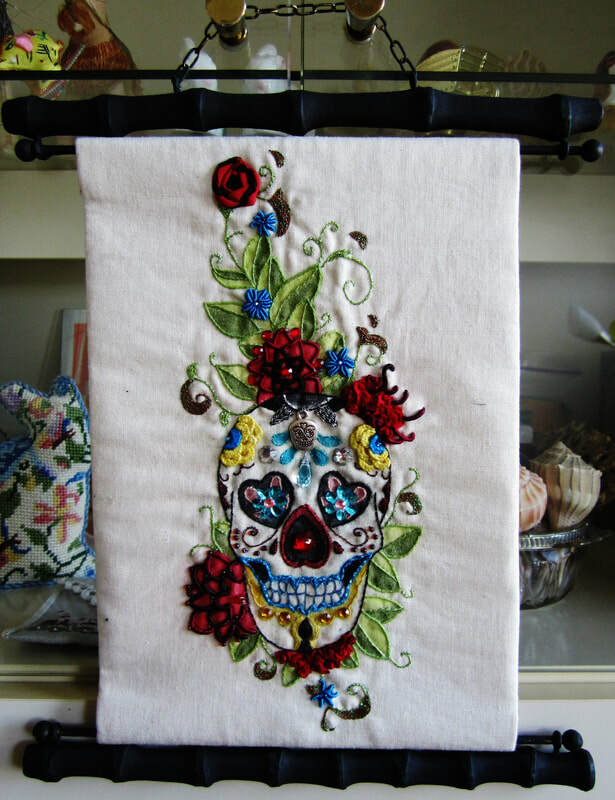 Evaughn Heath says, "I create unique items using my talents as a seamstress, an artist and a embroideress. I might use all three of my abilities together to create something or a combination of two. Sometimes I might just use one. 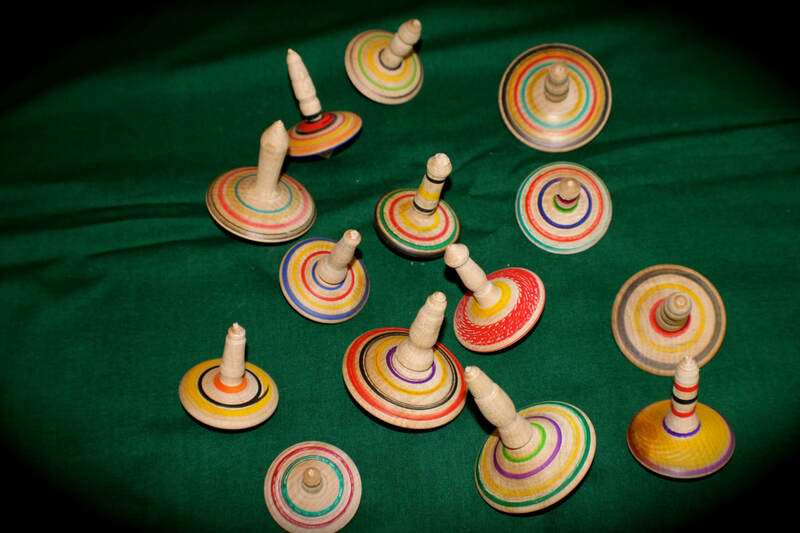 I was introduced to the world of creativity at a very young age. 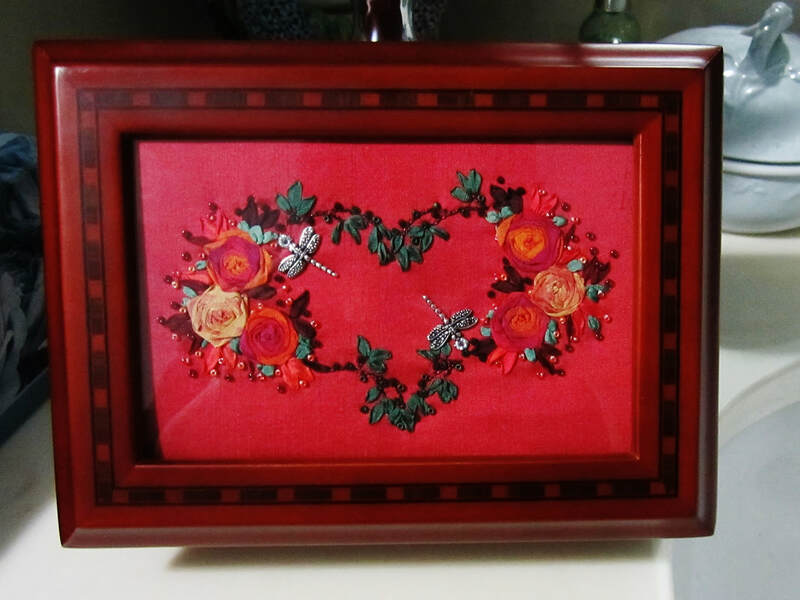 I was taught how to crochet and knit first and when I saw my mother embroidering pillowcases for a friend, I knew I had to learn how to do that as well. I was taught sewing by my godmother when I was a young girl and immediately fell in love with all the colours and textures of fabric. I entered the "art community" when I lived in the USA and learned how to paint using most mediums. 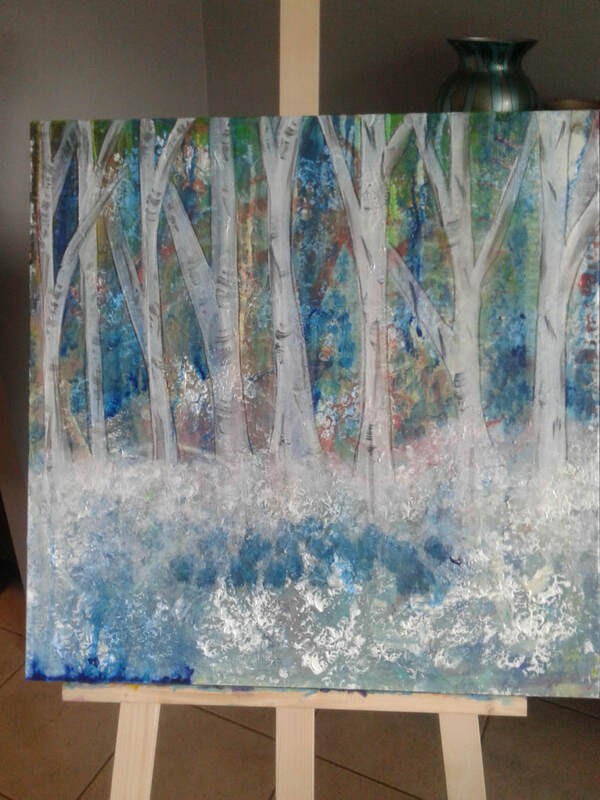 My oldest sister was a well known and respected artist in the Peterborough/Buckhorn area and it was her passing that motivated me to see if I had the ability to paint." "Every thing I create is fun! I bounce back and forth from one technique to the other so everything I do is unique and pleasurable. I pursue many different themes depending on the medium I am working with. I have a workroom which never seems to be big enough! lol"
While working, Evaughn always listens to music. 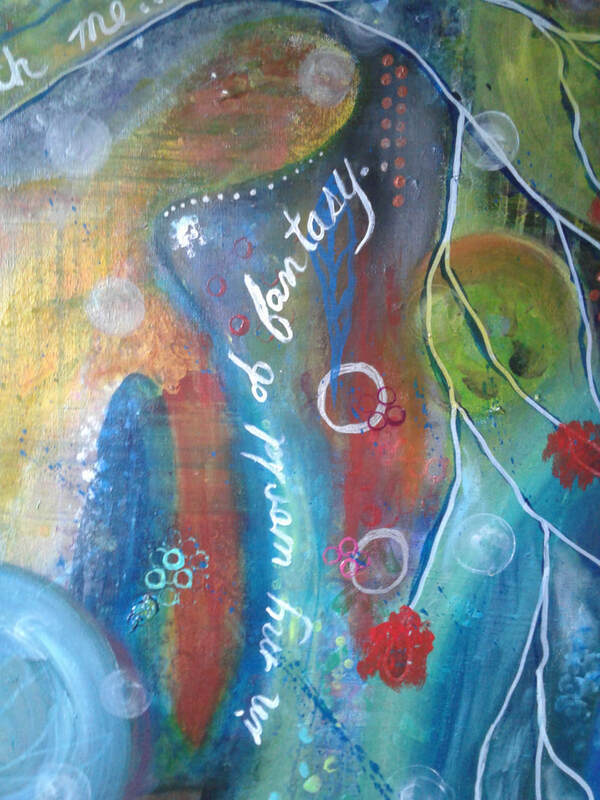 As far as inspiration goes, she says, "My inspiration for creating comes from many different sources from nature to books and anything in between. I f ind that if I listen to my "inner voice" and look at things with my "creative eye" then inspirations come much more easily. My sister is one of my biggest inspirations because I bounce a lot of ideas off of her. She will show me a different way of looking at things which usually results in a creation or helps with a continuing project." When asked what the most difficult part of the process is, Evaughn says, "​Choosing what to do! I usually have several different projects on the go at one time. Also, I sometimes will second guess myself when I have decided on a project. If I do that, then it usually gets shoved aside until I have the confidence to just do it!" "I did this seahorse for my friend and it has to be by far my most favorite creation so far. 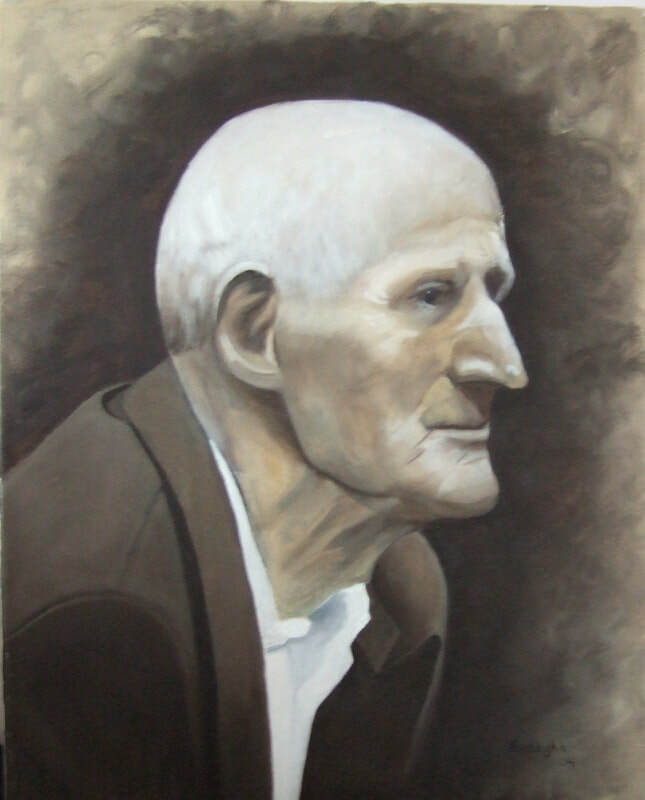 Back when I painted with oils, I painted this picture of a photo I took of this old man when I was in Europe. Since I don't use oils any longer, it is my favorite painted piece." When asked for the most memorable response to her work, Evaughn says, "​When I was painting with oils, I entered a juried show and won first place for my entry. The painting hung in an art gallery for a month. It was very exciting to have my peers present me with this prestigious award. This will be the first time I have entered an artisan show so I guess I am about to find out! lol"
"I trust in my spirituality and my inner voice to guide me. When I find that I am struggling with creating, then I turn inwards and look for guidance. For me personally, being creative is what feeds my soul." When not creating, Evaughn says she is "Thinking of different things I could create! lol I like to read, cook and hang out with my friends." 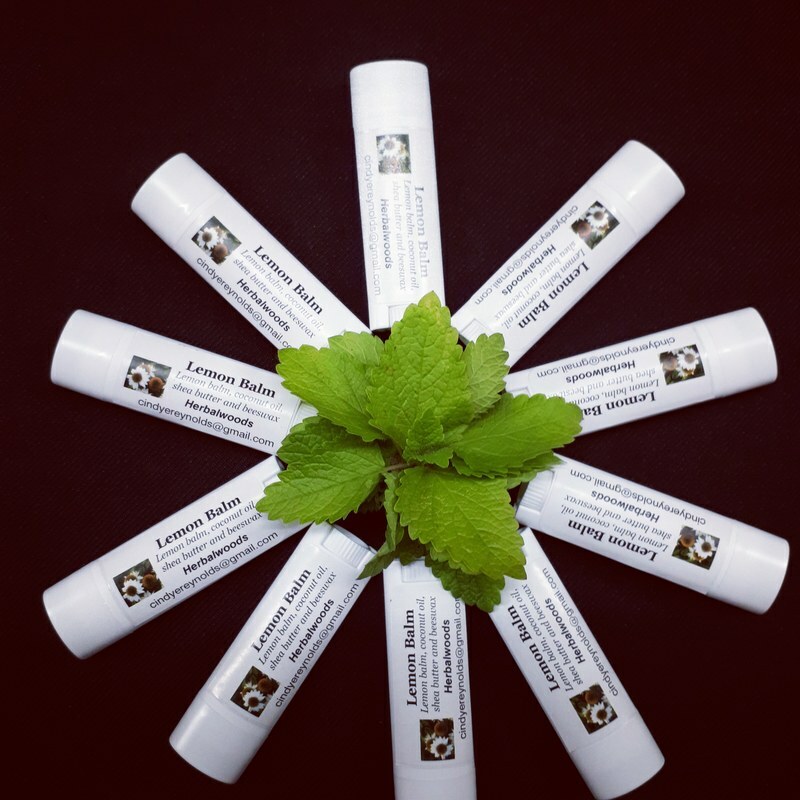 Meet Evaughn at The Artisan Fair at the Evinrude Centre in Peterborough on December 9th, 10-2! 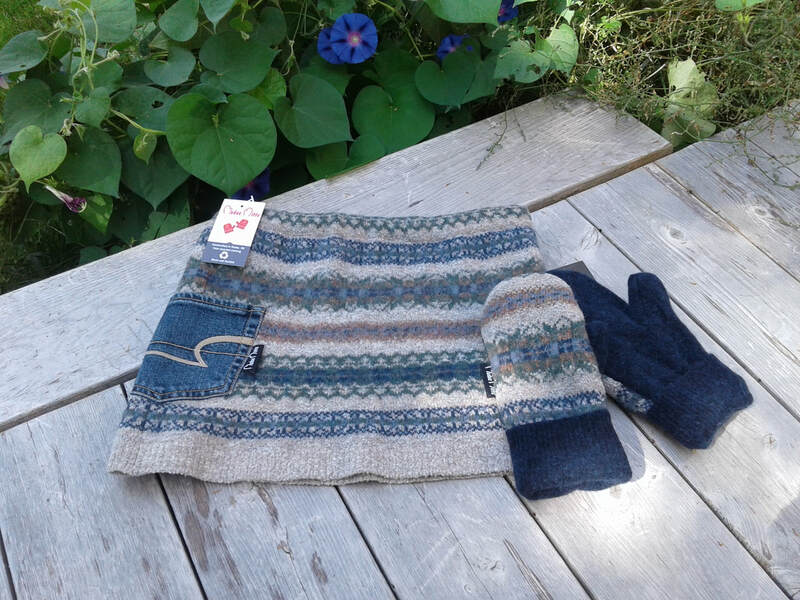 Kate Andrew of Madoc Mitts creates a variety of unique Mitts using recycled sweaters and other clothing. 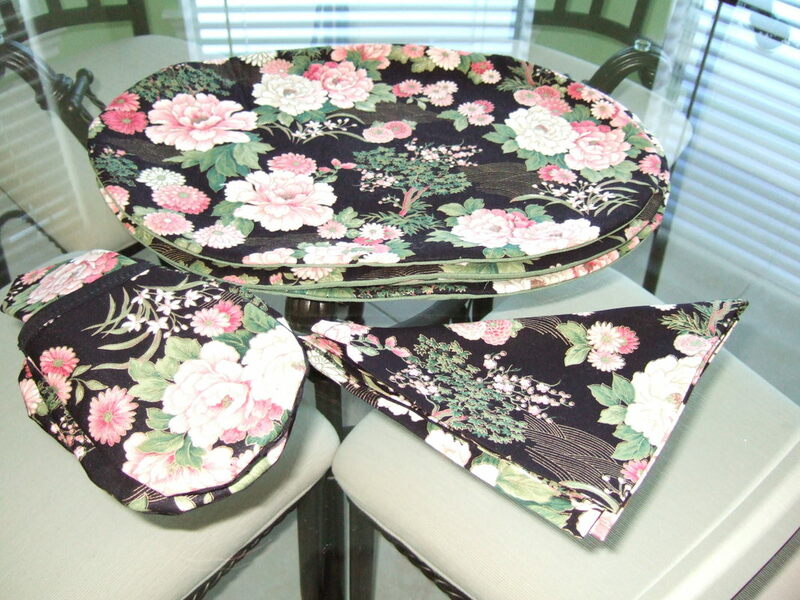 "We have recently started making Bottom Warmers to utilize more of the recycled material." ​"Living on a farm I needed something durable and warm for doing chores. There just weren't any reasonably priced mitts available that did what I was looking for. 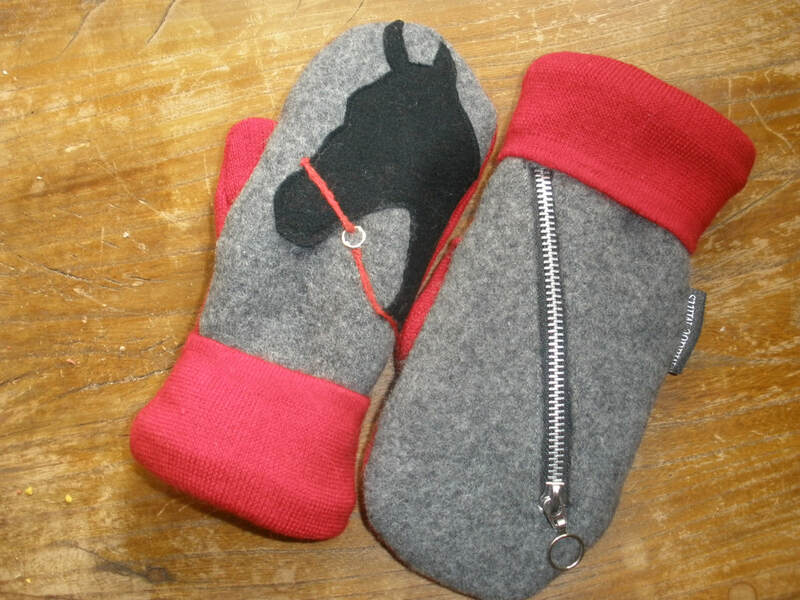 I had heard about recycled sweater mitts, so made a pair for myself but added fleece lining and embellishments. Then, people started asking where I got them ..."
"I love the uniqueness of each pair of mitts. I never know what they will look like until I take those final stitches on the cuffs and slip my hand in to ensure they are comfy and cozy. I want my mitts to be durable, so I look for colours and material that stand up well. 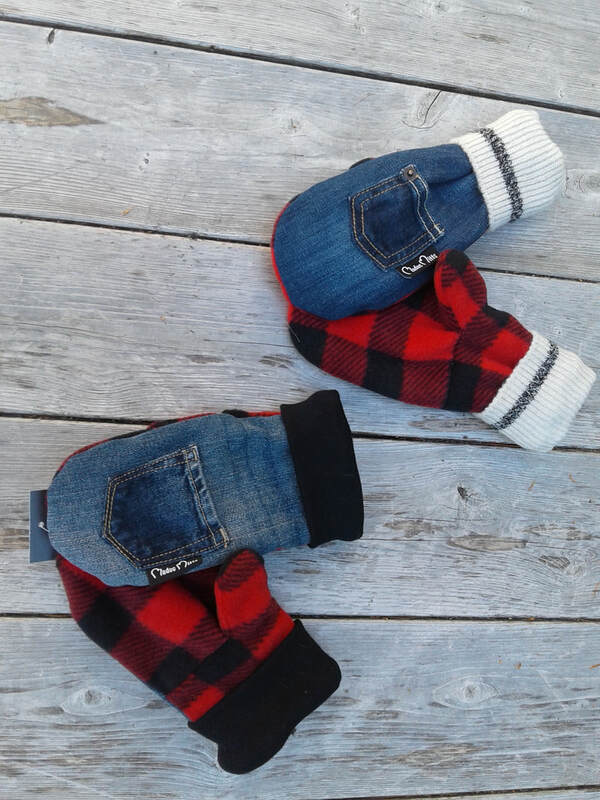 I like doing tribal themed mitts using embellishments and pet themed mitts, but also do Hockey Mom Mitts from recycled hockey socks, and, if I have a plethora of recycled jeans, I work on cabin mitts." "Creation takes place on the kitchen table. I start making mitts in August. When sales start to decline between Christmas and New Years, I relax. However, this Spring I had a contract for 40 pairs of mitts for the Moms of a team going to a Halifax hockey tournament in March so I sewed right up until March 1st." "Availability of fabric fuels my inspiration. When I see a shrunken sweater at the thrift store, my mind goes into high gear looking for things to complement the colours and texture." When asked what's the most difficult part of her process, Kate says, "Procurement of suitable recycled clothing that will successfully morph into mitts is difficult and I sometimes find myself looking for a specific colour to no avail." "Many customers have told me that Madoc Mitts are the best mitts they ever bought. My proudest moments come when a stranger contacts me to say they got a pair of Madoc Mitts as a gift and would like a pair to gift someone else." 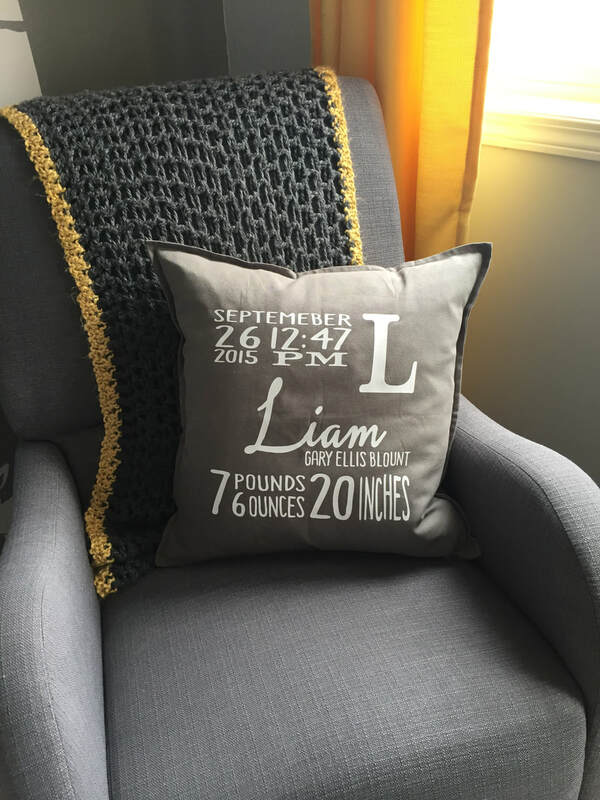 "I do all the sewing myself and I love custom orders. 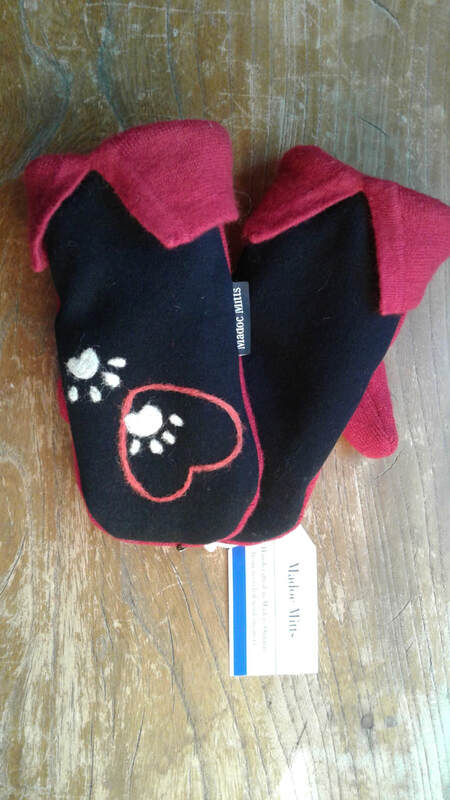 I also make Memory Mitts, using your loved one's sweater, fur coat, etc., or even your own favourite sweater that got thrown into the dryer and shrunk!" 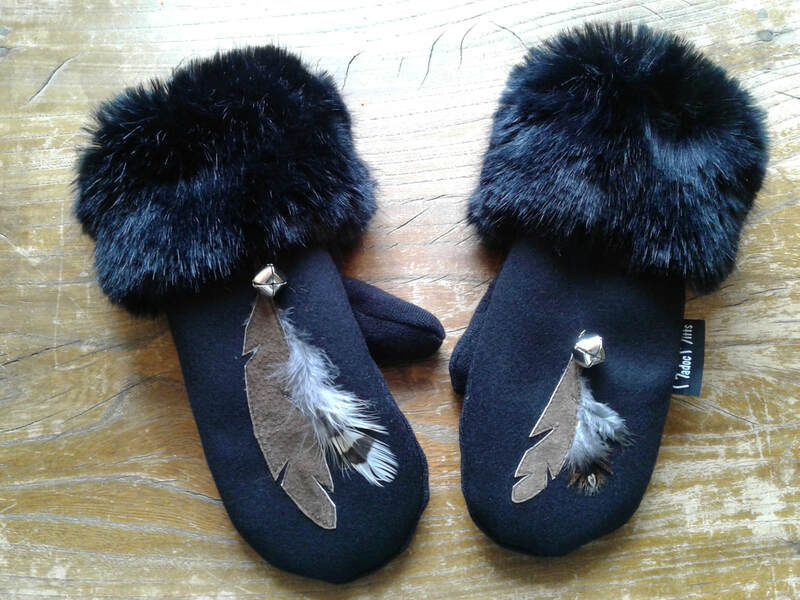 "Besides by private appointments at my home, Madoc Mitts are available at Lynn's Flowers and Gifts in Norwood and The Ravens Cache in Madoc. Madoc Mitts will be at various Craft Fairs and Shows between now and the end of the year. 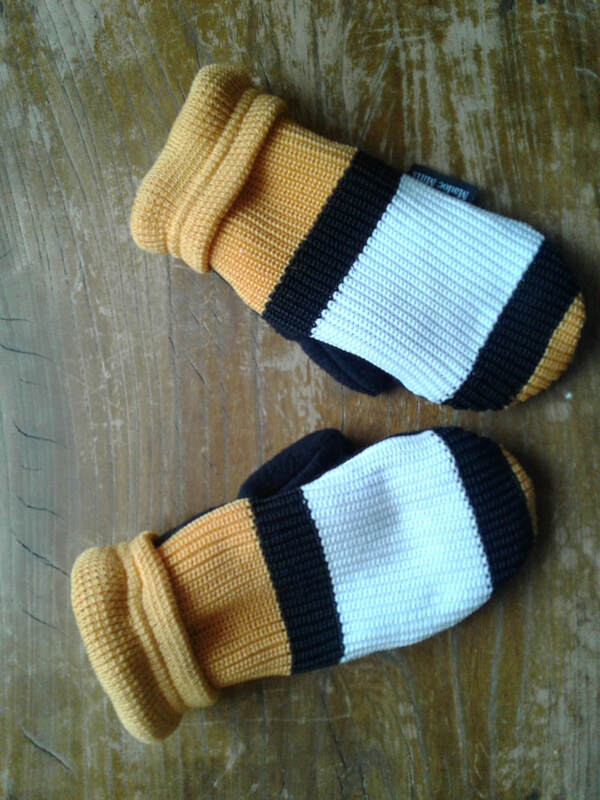 All dates and locations are listed on Facebook at Madoc Mitts." Meet Kate at the Evinrude Centre in Peterborough on December 9, 10-2 and try one of her mitts! 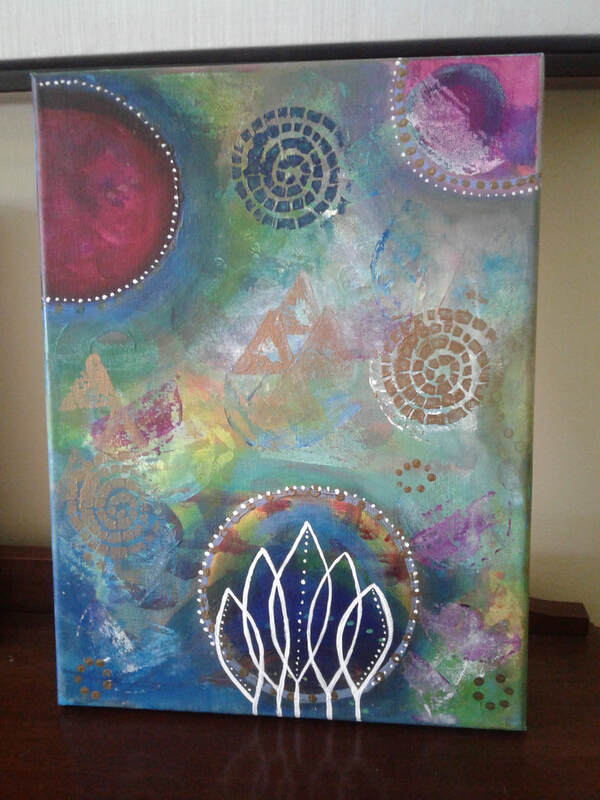 Judy Filion creates mixed media art on canvas, birch panels and a variety of papers. 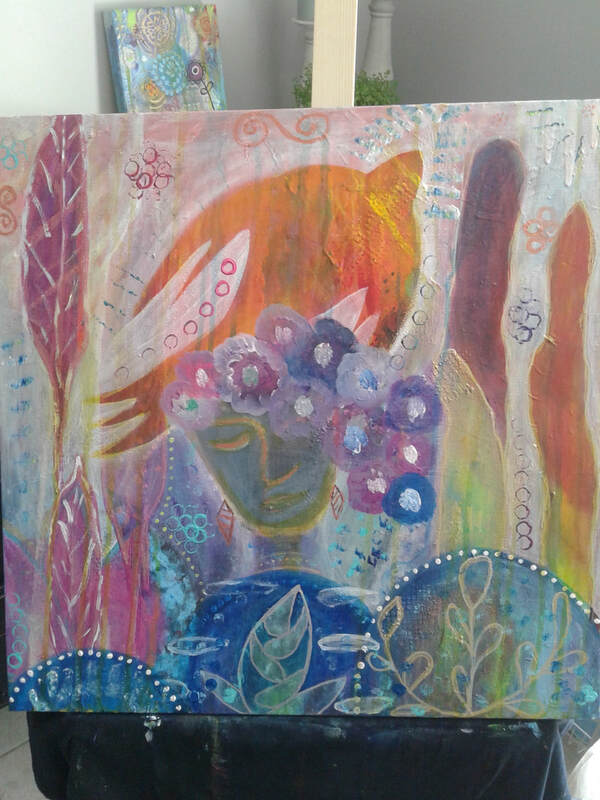 "After 30 years of not following my passion to create I was introduced to Intuitive Painting. I have been hooked ever since! Painting encourages me to let go, to feel, to allow things to just happen. Not only is it something to help keep me busy but it is therapy as well, in a good mood it will even make me more happy, in a bad mood and it will always help me feel better"
When asked which item she has the most fun creating, Judy says, "I don't have one item but the part of the process I love is starting. I can really get lost in the process of developing the first layers, using my fingers and mark making. It is always fun being hands on (literally) and seeing how things progress. I do find that at different times certain images will appear. 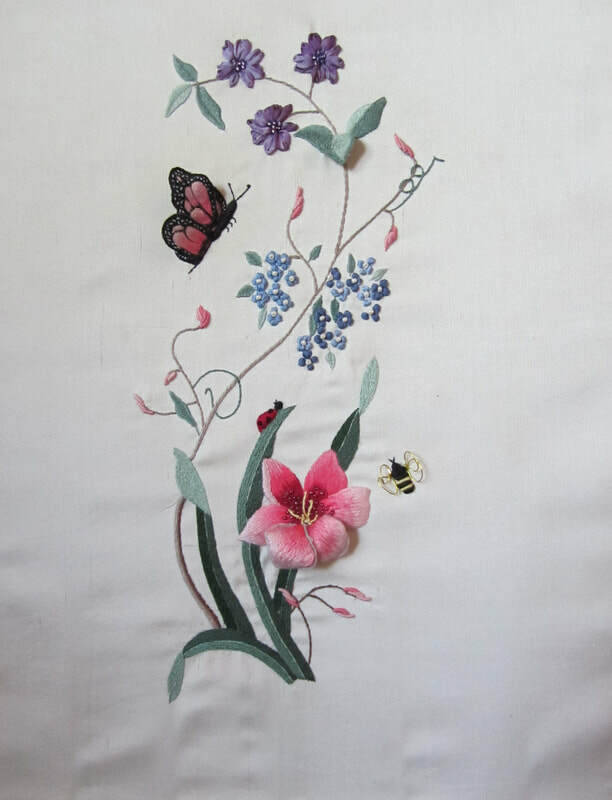 I'm inspired by Nature so butterflies, flowers, birds and dragonflies show up quite often. I've been pleased when images, faces and spirits appear!" Judy lives ina one-bedroom apartment, so her dining room has become her studio. While creating, she sometimes listens to music. She finds the quiet to be nice as well. Judy is inspired by "the great outdoors" as well as other artists on social media. When asked what's the most difficult part of the process, Judy says, "Finishing ... knowing when it's done. Also believing that you ARE good enough and someone will love your work." Memorable responses she's had to her work have been when others have referred to her as an artist and have given her constructive feedback. 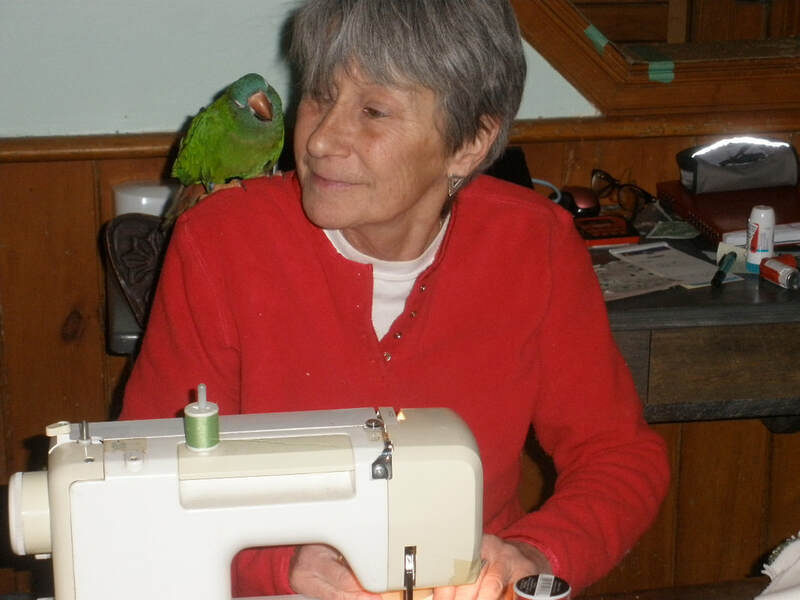 When not creating, Judy walks her dog, Delilah, gardens, cooks, knits and works.You can buy her work at 110 Douro Street or from My Passion on Facebook. 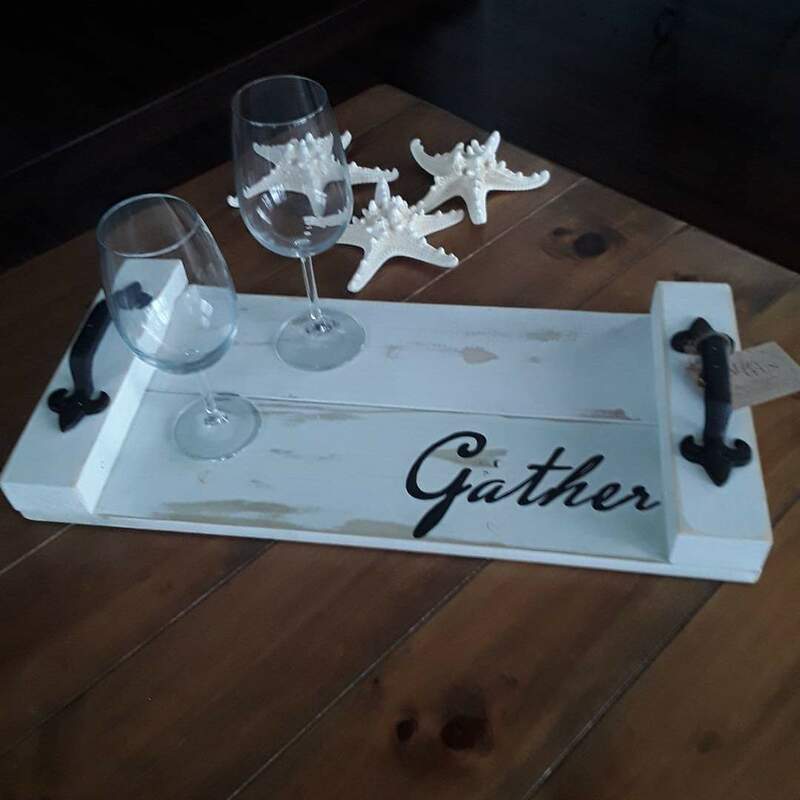 You can also meet her and buy her pieces at The Artisan Fair on Dec 9th, 2018 at the Evinrude Centre in Peterborough between 10 am and 2 pm. 15-year old Naomi says, "I create Slime. I also travel the world to find wild dragon eggs. For serious. A dragon took my leg once, but it grew back. Just kidding. No legs were lost and I don't travel the world looking for dragon eggs. 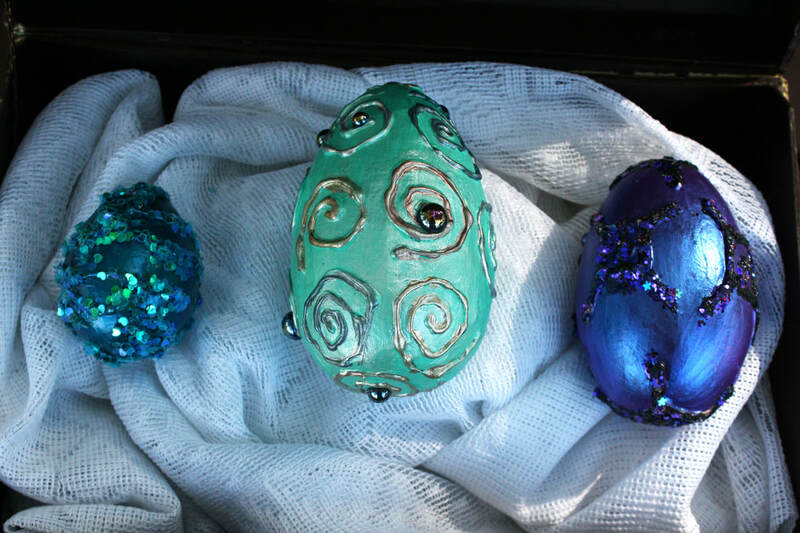 I do make slime and I decorate eggs to look like they belong to dragons. Its a joint effort with my mom. She does a lot of sourcing the materials." "​It all started one Easter, years ago, when I was but a youngster. We hard boiled eggs to decorate. I asked my mom if there was another way to decorate eggs without boiling to keep them. 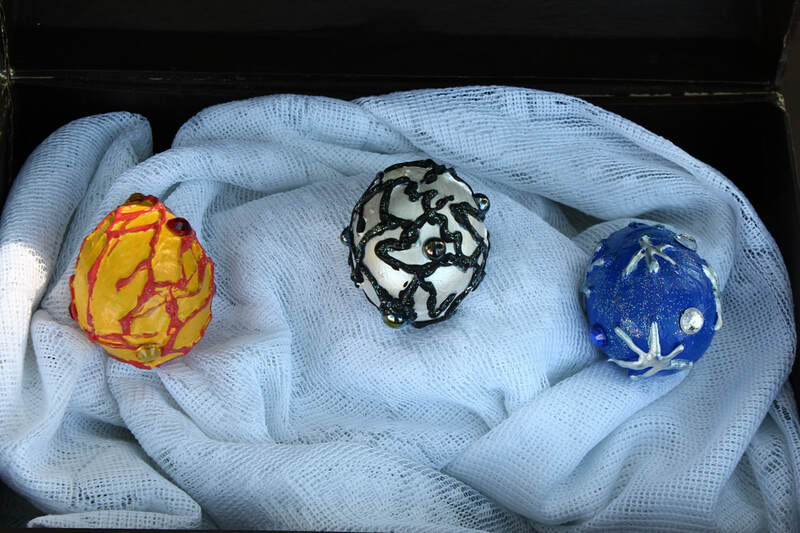 Sure enough, she said we could hollow out the eggs, soak them in a watery bleach solution, let them dry, and we can decorate them. Those eggs will keep without going bad. 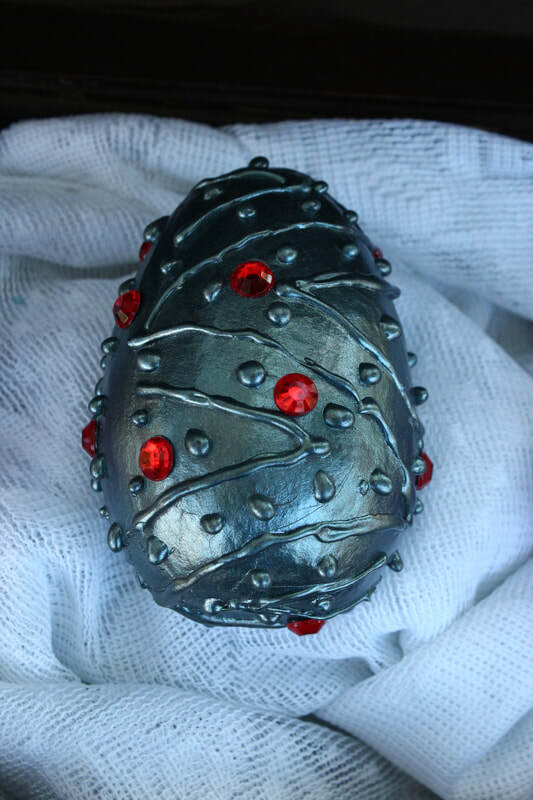 Years later, we still decorate eggs.Then TV shows and movies inspired us to make dragon eggs. Our original eggs were chicken and goose eggs. We now have turned to paper mache eggs. 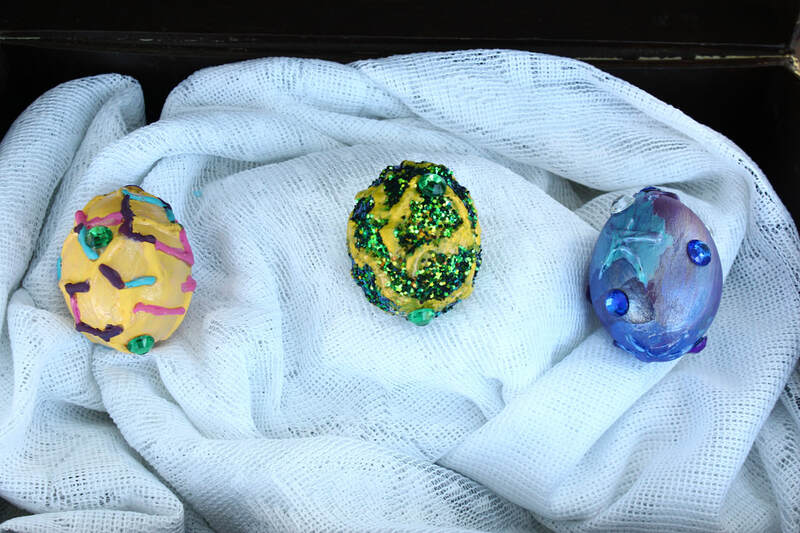 the paper mache eggs are more durable; they can be dropped without breaking. No more yolk on us. With the slim -- it's always been a Halloween party activity. Now the slime is an internet sensation. We decided to follow the hipsters, and sell our own slime. Our slime isn't gooey, or sticky. The texture is a perfect mixture of elastoviscosity." When asked which item she has the most fun creating, Naomi says, "Dragon Eggs, definitely eggs. Now that I think about it. AHHHHHHH. A dragon egg take days to make. So it depends on the time. Slime gets created in minutes. Also, it depends on the creative urge. Do I want to paper mache, paint, gem, or do I want to slime. 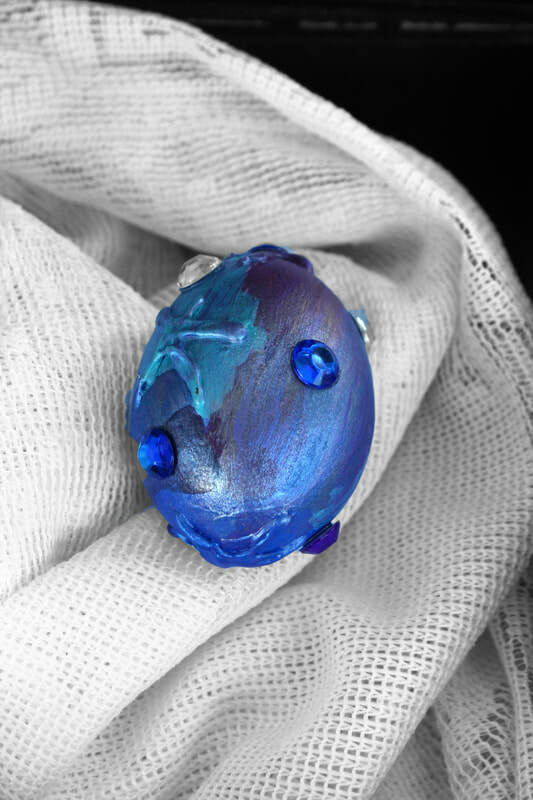 Dragon eggs require many materials, whereas slime only needs three materials and the glitter." "I tend to use many spirals in creating the dragon eggs. I also tend to go with the flow of the glue . Sometimes I have an image I'd like to put on the egg, but the glue doesn't want to co-operate. Sometimes, there is a crack in the egg, just go with gluing the crack and take the idea from there. Not all dragons are from volcanoes, I have water dragon eggs, ice dragon eggs, garden dragon eggs, kitchen dragon eggs, junk yard dragon eggs." "Just down the street from us there is a cave with a wise old dragon. He lets me create the eggs there. But he doesn't like the slime too much. So I make the slime in our kitchen. The inspiration comes from everywhere. I noticed a t-shirt with a diamond pattern. I thought, hey, that would make a good dragon egg. Also, a turtle was crossing the trail, and the pattern on the turtle shell, another great inspiration." When asked what's the most difficult part of the process, Naomi says, "For the eggs -- it's got to be the paper mache. It's such a long process. Waiting for the paper mache to dry, another difficult process. With the slime, the colour changing slime is the difficult one. The slime has to be at the right temperature to change. Until the slime reaches the perfect temperature, it will not change colour. In that case, a bowl of warm water speeds that process along." When asked what her favourite piece of work that she's created is, Naomi responds, "The Chaos Egg Series. Glue, gems, splotches of paint. Those eggs are always the first to be sold. There is no planning, no care, its just how the glue, gems and paint come together. With the Slime -- people of all ages like the feel of the slime. It doesn't feel, act, or look like SNOT. People love the colour-changing slime -- it's so different. But the slime is a difficult one to produce. We encourage the slime to change colour by keeping it warm. Once it gets to its new home- it doesn't always behave. The Glow-in-the-Dark Slime! That is a great hit. With the dragon eggs. Its nice when people pick up the eggs, and tell us what kind of dragon they think it might be from." "At the moment I am the youngest vendor. 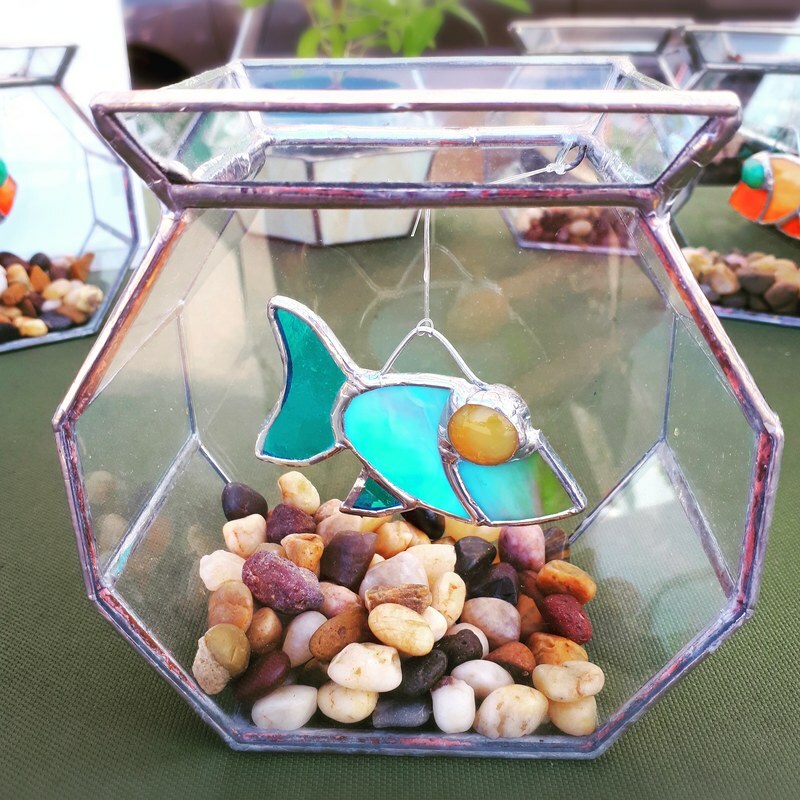 I started as a vendor at craft sales when I was 12 years old. I am now 15 years old. I will be using the profit of these sales toward my post secondary education." When not creating, Naomi says she is "going to school, doing homework, playing on the computer, or doing some camping." You can meet Naomi Day at Mark Street United Church on Sept 1st, between 10 and 2. 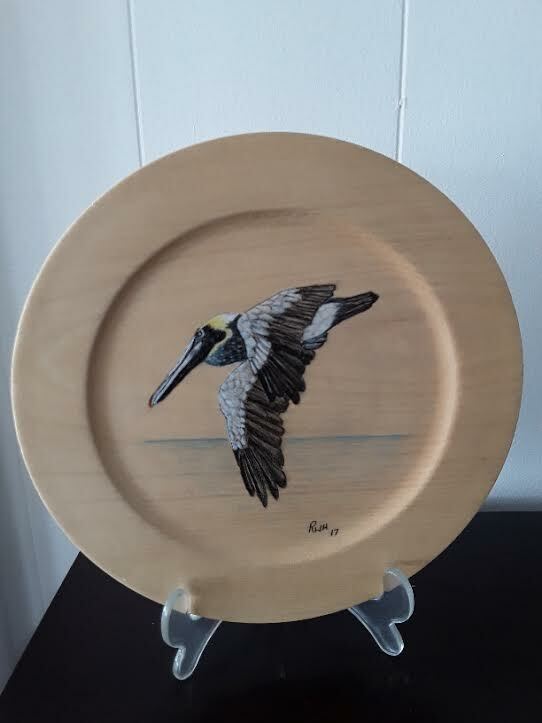 Robert Holdforth creates bird and wild fowl pictures on wood plates. "Many years ago, 1986 I made a rocking horse for my first grandchild, from there I got into carving birds for competitions." Meet Robert at The Artisan Fair on May 5th between 10am and 2pm at 90 Hunter St East in Peterborough! 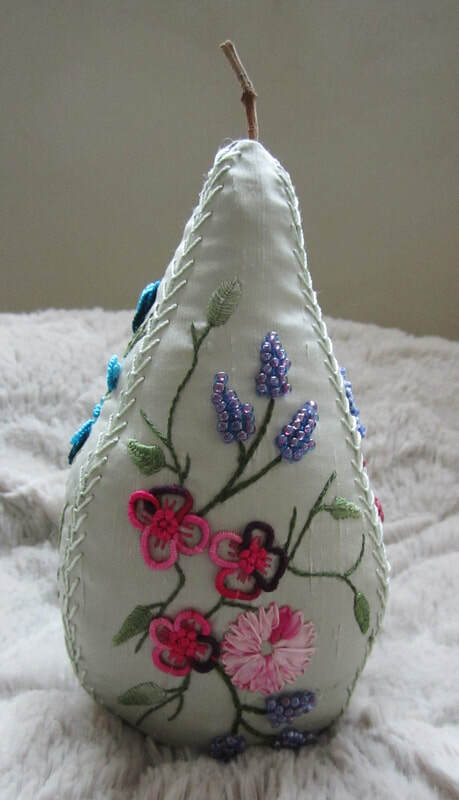 Over the years Jane Karjala has enjoyed creating a variety of pieces of work from sewing to woodwork, painting and making candles. 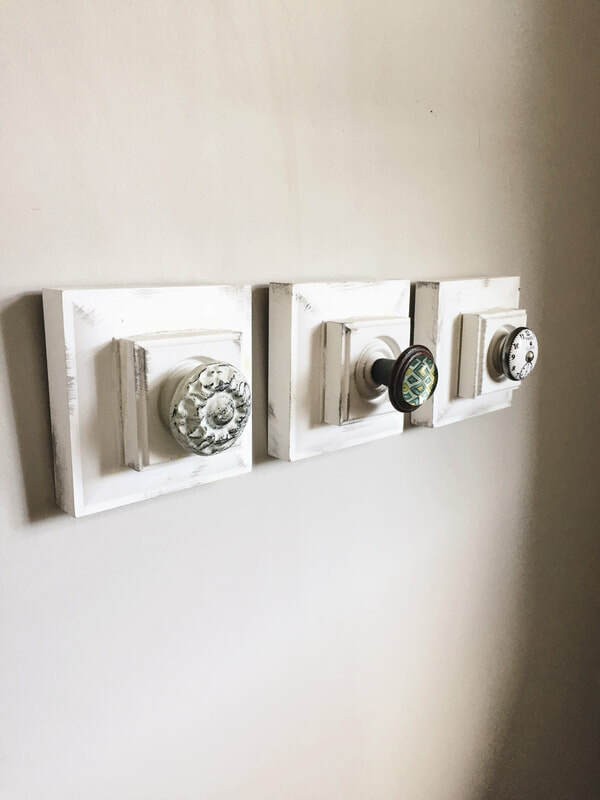 Last year she started using reclaimed wood and barn boards. 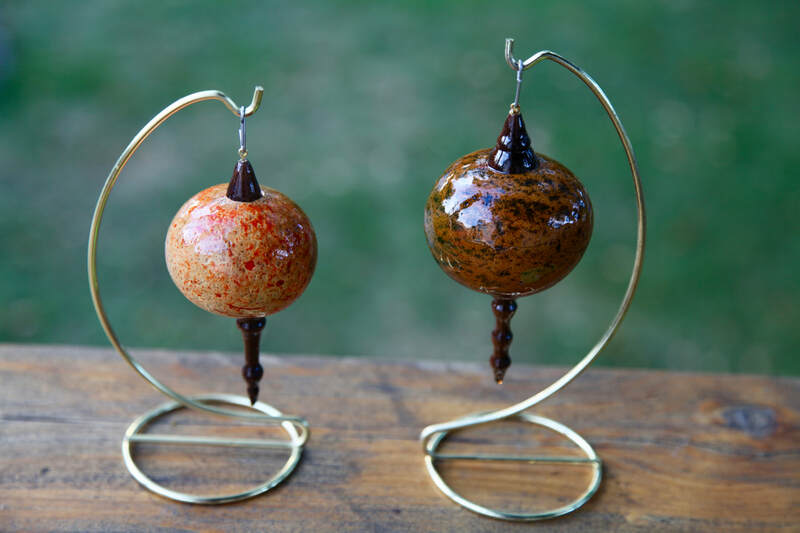 "​I really enjoy custom orders, they are a one of a kind piece, and at times came be very challenging." 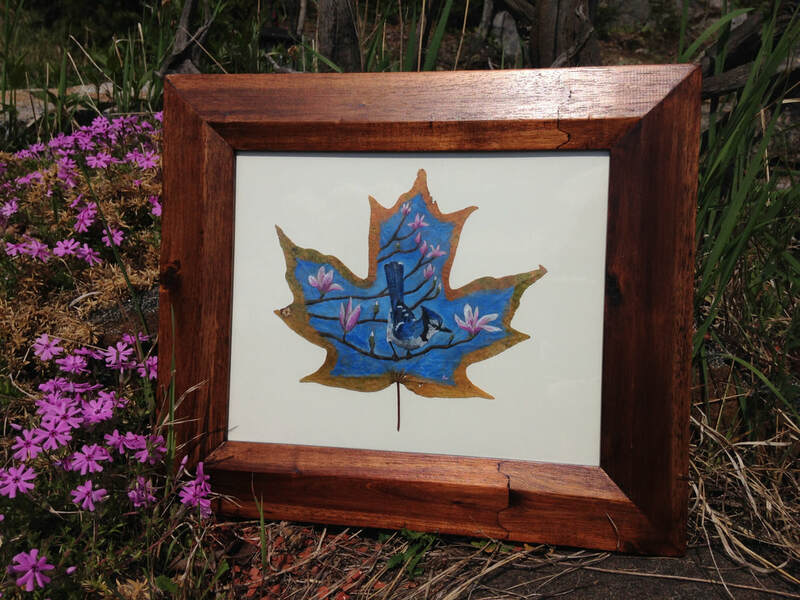 Meet Jane on May 5th at The Artisan Fair (90 Hunter St East in Peterborough), from 10am - 2 pm!